Yesterday, AP CM Nara Chandrababu Naidu announced rankings to his cabinet ministers and MLAs based on their administration and the developmental works they carried out in their constituencies. 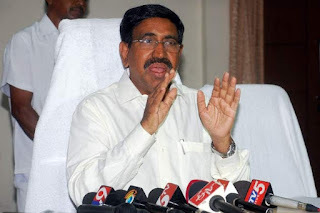 Surprisingly, P Narayana, the Municipal and Urban Development minister who played a key role in the land pooling and acquisition in the capital region, secured the last rank (18). With this, TDP has hit a self goal as the rankings led to a series of satires and doubts over Babu's cabinet. Especially, Narayana 's last rank led to a flurry of satires as today, his Narayana group of educational institutions secured top ranks in the intermediate examinations. Several of Narayana's opponents are ridiculing that Narayana may be promoting his institution's top ranks, but he himself has nothing to gloat about his political achievements thanks to the last rank. This has deeply upset the TDP cadres and Narayana's close associates and even sent wrong signals among the common public about Narayana. Apparently, even Narayana has reportedly been upset with his rank. Until now, Narayana has been maintaining an aura of being one of the most efficient ministers in the state, but Babu has taken away all his happiness yesterday. To make amends, Babu reportedly telephoned Narayana to pacify him and even suggested him to ignore the rankings and concentrate more on his future responsibilities.